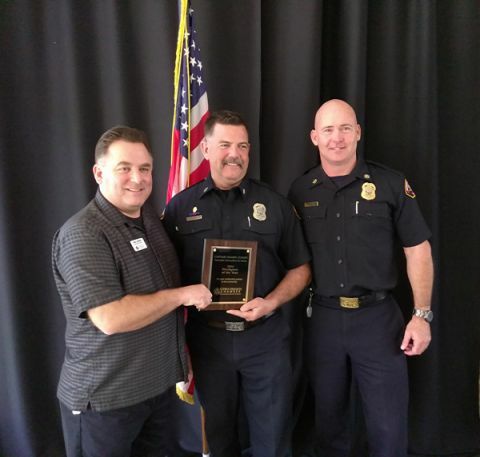 Captain Shawn Condit began his fire service career with American River Fire Department on August 4, 1990. In 2000, American River Fire District and Sacramento County Fire Protection District merged to become the Sacramento Metropolitan Fire District, also known as Metro Fire. Shawn is the Truck Captain at Fire Station 109 where he oversees a truck crew of three firefighters. Station 109 is located in the Carmichael community and is unique in that this is where the Hazardous Materials unit is housed. Captain Condit coordinates the Hazardous Materials program for our department. Throughout his career, Captain Condit has demonstrated leadership on multiple levels. Aside from being an excellent company officer, he has been a leader in the Hazardous Materials Program. His tenure in the program provides the stability needed while offering training opportunities for his crew. Captain Condit and his crew willingly take on new employees and are often called upon by the training cadre to work with academies and probationary employees. When these new individuals spend time with his crew, they are provided with a positive experience and given information that will hopefully move them down the road through the process. In addition to all his regular responsibilities at the station, Captain Condit must maintain his Hazardous Materials certification, putting added responsibility upon himself. In addition to his hard work at Metro Fire, Captain Condit serves as a Metro Director with the Sacramento Area Firefighters Local 522 union. This is an elected position by his peers. Shawn has held a position within the Union for over 10 years. He is an acknowledged leader within the union, and over the last 10 years he has moved up the ranks, starting out as a shift representative and eventually moving into the elected position he currently holds. He continues to do an outstanding job of representing the union members of our organization. As Metro Director, Captain Condit represents the membership in many different ways. During our last contract negotiation, Captain Condit demonstrated calm, consistent leadership during the negotiation and confirmation process, acting as the facilitator for these meetings. He allowed for spirited but respectful debate. During these meetings, he is often involved in matters that are sensitive in nature and does not violate confidence. It is this trustworthiness that makes him an excellent Union officer and, by extension, Company Officer. As a Union leader he takes a positive role in a needed position. Often times, employees are referred to him by management. His ability to listen fully to their problems and then calmly and positively advise them on a course of action tends to benefit both the department and the member. He acts in the best traditions of Union leadership and through this process, the matter is often resolved at the lowest level. To be a leader, particularly as a firefighter, your work ethic must be self-evident. Since an outstanding work ethic is common at Metro Fire it is difficult to point out where one employee’s efforts are better than another, however in the case of Captain Condit he stands out each and every day. Many excellent company officers come to work and do their assignments and perform admirably, but taking a leadership position in the Union and Haz Mat program shows that Captain Shawn Condit is willing to give of himself to this department and its members. He is well respected within the Department, the Union and his crew. Fire Chief Todd Harms was honored to name Captain Shawn Condit as Metro Fire’s 2016 Suppression Employee of the Year.